Datasoft Business Modeling provides a user-friendly platform to manage workflow efficiently and effectively. Various features can be administered by business users and process experts with no programming experience making it easy to design and govern workflows, increase streamlined efficiency, and drastically reduce paper-based processes. With complete integration of Business Modeling into Datasoft ERP's framework, enterprise-wide process automation can occur from the front-office, mid-office and finance operations. You will be able to streamline and govern workflow, rules, limits, approvals and documents throughout your business processes. Datasoft Business Modeling is designed for an adaptive approach where business process engineering and governance can be embedded on a single platform and continually refined for improvement. Streamlined efficiency and control is achieved throughout your company making business activities become consistent, repeatable and measurable. 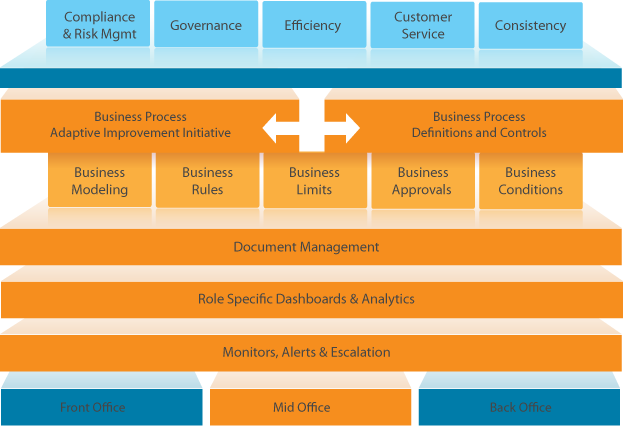 Increase efficiency, compliance governance and risk management through workflow automation. Approvals and limits are fully customizable to complement your business activities and risk management. Datasoft Document Management radically reduces paperwork.